The Railroad Station at Napanoch. Vintage image from ENYCF centennial booklet. As we prepare for our October 1, 2000 Centennial, Eastern New York Correctional Facility continues to be mindful and proud of the tradition of connectedness that we have with the surrounding community of Napanoch within the Town of Wawarsing. At the completion of the facility tour, each "open house" guest was invited to visit the restored railroad station elsewhere on the grounds. Those who did saw an excellent video about Eastern, viewed interesting historical photos and artifacts, and came away with fact sheets about the station, the text of which is presented here. In this regard, we recognize the historic value of the 1902 O&W Napanoch Train Station, which is on facility (New York State) property. The Station played a key role for the facility -- which had just opened -- through transport of material to continue the early building phase, prisoners, and coal and other supplies. Likewise critical to the community (as some may still remember) it succeeded the D&H Canal, and served as a nexus for meeting and visiting friends and family, a destination and waystation for summer boarders, a source of supplies for storekeepers and customers, a means of getting local goods to other markets, and a means for delivering the mail. 1898 Nov.5 -- Last coal boat on D&H Canal leaves Honesdale, Pa.: closed permanently to Ellenville from which point it remained in service for the next three summers. 1899 July 3 -- D&H Canal sold to Cornell Steamboat Co.
Nov. 13 -- Delaware Valley & Kingston RR incorporated in the interests of Pennsylvania Coal Co. to run on roadbed of abandoned D&H Canal (purchased from the Cornell Steamboat Co.) from Lackawaxen, Pa. to Kingston. It is bitterly opposed by both the O&W and the Erie. 1900 Jan. 6 -- Kingston & Rondout Valley RR organized in interests of PJM&NY and O&W to build from Ellenville to Kingston. Work is started at Napanoch. March 15 -- At NY State RR Commission hearings into the Delaware Valley & Kingston RR, NYO&W announces that it has purchased stock control of Port Jervis, Monticello & NY RR. Nov. 8 -- Several independent coal companies purchased in the interest of the O&W to help dry up support for the Delaware Valley & Kingston RR project. 1901 Jan. -- Erie RR buys Pennsylvania Coal Co., ending threat of DV&K R.R. March 29 -- Ellenville & Kingston RR incorporated in interests of O&W. May 29 -- O&W purchased the abandoned Delaware & Hudson Canal from Ellenville to Alligerville and used sections of the canal right of way for its Kingston branch which was completed by the end of 1902. June 28 -- Contracts let for the new E & K RR. 1902 May 3 -- The first passenger train to Napanoch was run to bring inmates to Eastern New York Reformatory. June 16 -- The first portion of the Kingston branch is opened for regular service from Ellenville 40 Kerhonkson. Accordingly, we wish to preserve and restore it. To accomplish these goals, we have already achieved listing on the State and National Registers of Historic places, and we are moving to prevent any deterioration and begin its restoration. Once restored, we believe it has the potential to function as a small interpretive station/museum (accessible to the public on a scheduled basis) that would bring some local and regional history alive again through displays of photos, documents, artifacts and memorabilia. Loan or donation of such items for future display would be very much appreciated. Anyone interested in doing so may contact Jeff Rubin at the facility at (845) 647-7400 ext. 4326. 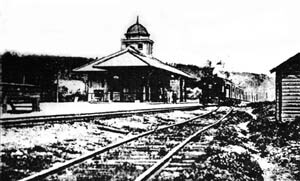 The 1902 0 & W Napanoch Train Station (which is on facility/New York State property) is an enticing remaining link to a grand heritage of successive transportation systems (all passing through this very same site), that literally steered the course of this area's history: the Lenape Indians (who gave Napanoch its name, meaning "Land Overflowed by Water") hunted, traded, and walked on paths that were later to becomethe Old Stage (coach) Road. From 1828 to 1901, the Delaware and Hudson (D&H) Canal expanded commerce and fostered industrialization here. From 1902 to the 1950s, the New York, Ontario, and Western Railway (O&W) brought faster, cheaper, year-round service. (The Napanoch Train Station sits astride the berme of the old D&H Canal.) The railroad, in turn, was supplanted by motor vehicles and the modem highway systen. U.S. Route 209, in close proximity to the Station, now serves many of the same communities that were on the Ellenville-to-Kingston (E&K) Branch of the O&W. One of only two O&W Stations (other is "Central Station") to be operated as museums open to public in New York State. One of only a few museums (out of more than 600 historical museums in New York State) that will be interpreting various historical aspects of intermodal transportation. Turn-of-the-century Mission-style Revival architecture designed by Jackson, Rosencrans & Canfield of New York City. Among the oldest Mission-style stations in the U.S. that still survive. Ontario & Western Railway Historical Society web site.